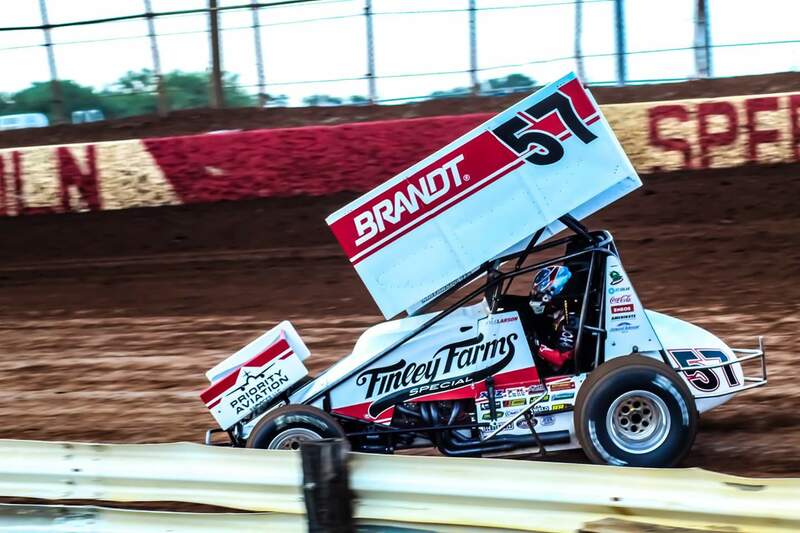 SARVER, PA – July 17, 2018 – Kyle Larson started fourth and worked his way by Ian Madsen on Lap 9 and never looked back to win his first World of Outlaws Craftsman Sprint Car Series Feature of the year and sixth in his career. Larson also set Quick Time over the 37-car field and won his Heat Race. Brad Sweet finished second with Donny Schatz coming from ninth to complete the podium at the Don Martin Memorial Silver Cup at Lernerville Speedway. Western Pennsylvania’s own Tim Shaffer won the Sears Craftsman Dash to earn the pole for the 40-lap Feature. Shaffer, the 1993 Lernerville Track Champion and two-time Silver Cup winner, led the opening four laps before Brandon Spithaler spun off the track, bringing out the only caution of the event. World of Outlaws rookie Ian Madsen took advantage of the double-file restart to take the lead from Shaffer down the backstretch. Madsen led lap five and Larson took second from Shaffer a lap later. Larson slid Madsen for the lead on Lap 8, but the Australian turned back underneath Larson’s No.57 to lead into turn three. It was short-lived, however, as Larson pounded the cushion and blasted around Madsen to lead the ninth circuit. Larson established he was the class of the field and quickly built up a lead as the field stretched out around the 4/10th oval. Brad Sweet, fresh off his runner-up finish at the Kings Royal, began making the top work and moved by Shaffer for third on Lap 26 and then used the same line to move by Madsen for second a lap later. Simultaneously, Donny Schatz began making the bottom work. Schatz worked his way into third on Lap 31. As Larson diced through heavy traffic, Sweet began to close in on Larson as the large crowd at Lernerville Speedway watched closely to see if the driver referred to as ‘The Big Cat’ could make a move. Larson was flawless through traffic, re-extending his lead and going on to win by 1.893 seconds over his brother-in-law, Sweet. “I was able to get through traffic pretty well. There was a strip of moisture in turns three and four. I was trying to check the board because I knew if [Schatz] was coming, I was going to have to do some searching,” Larson said in Victory Lane. “These Outlaw races are so hard to win. I was able to get an Outlaw win for Ricky [Stenhouse] last year, but it has been a couple years since I got an Outlaw win in the No.57,” Larson added. "It’s great to see a packed house, I was only able to get here five minutes before engine heat because of plane troubles, but I’m glad we made it. We couldn’t be out here without all you fans,” Larson, who won everything but the Sears Craftsman Dash, said to a loud applause. Brad Sweet settled for second and referenced how similar tonight was to Saturday’s Kings Royal, where he was trying to chase down Schatz on the cushion. “You know [Larson] is going to be tough to beat out front, I wasn’t making as much speed once the top in turns one and two went away. I kind of saw Donny coming at the end so I moved down on the race track,” Sweet said in good spirits. "The past few races the tracks have been slick and technical with a lot of Green Flag laps, it’s been a lot of fun. We’ve been right in the hunt throughout this Month of Money and hopefully we can pick up some more wins here soon,” Sweet added. Schatz came from ninth to complete the podium and referenced his slow start, “We were a little better at the end than at the beginning, but we’ve got to be better earlier. It wasn’t a bad night or a bad finish, it was just one of those nights,” Schatz, who had won three of the last four races prior to tonight, said. David Gravel came from 10th to finish fourth with Ian Madsen fading to fifth. Kasey Kahne made a last-lap pass in the Last Chance Showdown to make the Feature and earned KSE Hard Charger honors coming to 17th at the Checkered Flag. The World of Outlaws Craftsman Sprint Car Series continues its 40th Anniversary Season with a trio of dates with the Pennsylvania Posse starting Thursday, July 19 at Lincoln Speedway before heading over to Williams Grove Speedway for the Summer Nationals. If you can’t make it to the track, watch all the action LIVE on DIRTVision.com!